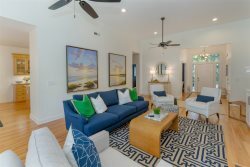 This exceptional 4 bedroom, 3.5 bath oceanfront home is located on the 15th hole of the Turtle Point Golf Course. With amazing ocean views and easy beach access, it's the perfect island vacation destination. Sea breezes and rolling waves can be enjoyed from 2 levels of decks running the entire length of the house. The lower porch is screened. Inside, walls of windows showcase the lush green golf course and blue Atlantic Ocean. A reverse floor plan with the open concept living area on the upper floor makes the most of the homes location. Design elements include polished wood floors, high ceilings with crown molding, and European minimalist furnishings. The colorful living room offers comfortable seating and a sleek dining table seating 10. Modern custom cabinets and granite counters highlight the gourmet kitchen which includes a large island with stove and double wall ovens. Downstairs, each bedroom is furnished with luxury German beds, which are low to the ground, very comfortable and great for your back.There are no televisions in the bedrooms. However, a cozy sitting area off the bedrooms offers a flat screen television and game table. There is also a television in the upstairs main living area. The home's central location makes it only a short walk to the Sanctuary Hotel, East Beach Village, Town Center Market, and Roy Barth Tennis Center. The community pool is just around the corner. Other Kiawah Island amenities include over 30 miles of bike trails, 5 world class golf courses, and a variety of boating and fishing. Spend your next vacation surrounded by the natural beauty of Kiawah Island in this impressive home. Please note grilling is not allowed at this home. **Owner will consider monthly rental rates during the months of January and February. Please inquire if interested. We enjoyed meeting you and certainly have enjoyed your lovely home. Perfect for the kids! As always, Kiawah Island leaves us breathless! P.S. Thanks for the wine! We have our thanks to the family that lives here. It's a wonderful home. We love the view and the amenities this home has to offer. The funniest part of the week was that we didn't find the outdoor shower until the last day. We enjoyed it though! We love this house, almost as much as we love the beach! We have rented homes through Sweetgrass before and we are never disappointed. The bottle of wine and note were a nice surprise and gave it a personal touch- thank you! We loved staying at 32 Turtle Beach! The house was perfect- we could sit on the porch and watch the ocean, and just a short walk to the beach. The kitchen was well equipped and the beds were comfortable. Everything was wonderful! Absolutely stunning vistas from the second floor (the main floor with the kitchen, dining table and family room) -- a vast shoreline and a pristine hard pan beach with the constant soundtrack of cresting waves all lies across the 15th Hole fairway on Turtle Point Golf Course. A big roomy main floor, a hideaway giant, well-appointed kitchen, four bedrooms downstairs, with low cut Euro beds approachable on all floors, giving life to the phrase of crawling into bed, an 8-iron to the Sanctuary, a easy bike ride there with the wind on the beach, a nearby Harris Teeter called the Village Grocery in Freshfields Village, right inside the gate, Charleston about 40 minutes away, the sun chinning up each morning and resting its weary eyes come dusk -- a beautiful place for a big family getaway. Sweetgrass! How sweet it is! Thank you for sharing your beautiful home! We loved the amazing view from the spectacular balcony as well as the simplicity of style. One of us is a big fan of the Shakers whose influence is seen throughout the house- love it! We hope to return! Thank you for making your beachfront home available to our family. This was our 1st trip to the Island. We were here with other childhood friends for a great summer reunion. There are so many adjective to describe how much we enjoyed this property. Everything was 5-star and met all of our needs. The ladies loved the kitchen and dining area and needless to say the fellas enjoyed the beach views and overlooking the 13th fairway. Thank you once again. We raised our family vacationing on Kiawah. How wonderful it has been to return with our children and grandchildren, and parents. Ages 1-89 enjoyed this beautiful home and exquisite views. Your home is perfect for a large family vacation gathering. Thank you for sharing it. We hope to return again. We have returned to 32 Turtle Point for many years. It is simply our favorite place on earth. The best oceanfront view on Kiawah. Very sunny unit all day because it is south-facing. Besides the oceanfront upstairs porch, there are 2 screened-in porches. One is oceanfront and the other overlooks a lagoon. We once again thoroughly enjoyed our week in your lovely home with fantastic views. Thank you for opening your doors to us so we can share in the beauty of Kiawah Island. We do hope to return again soon. The members of your team were very helpful and easy to work with. We all agreed the time went by to quickly. The weather was great except for a couple brief rain showers. It was our first time on Kiawah and we all agreed it should not be our last. Besides the beautiful home and fantastic view, it is a pleasure staying in a home where the owner really cares about the condition. As usual we enjoy the nature and also the numerous events put on by the Kiawah Island Arts council. Paradise Found. Friends that visit are amazed at the ocean view and have told us they have not been in any property with a better view. Because it overlooks a fairway, it gives the impression of a finely manicured front lawn that extends to the ocean. Since it is south facing you have sunshine all day. On days when it may be a little chilly in the shade, it is often very warm on the porch. If you prefer a lagoon view, there is a screened in porch over looking an active lagoon. You can sit and watch the Egrets and Herons fly in and out to your hearts content. You can take a short walk on the beach and arrive at The Sanctuary Hotel with a wonderful lounge and Spa. It is obvious the owners take pride in their home and immediately take care of any items that might need addressing. You can walk or bike to tennis, golf or a pool. We continue to come to this property because we love it so much." Beautiful house and property. The best view we have had!! The home was very clean and well stocked. Sweetgrass was timely and helpful during the reservation process. • All Interior Doors That Lead Outside: To open the doors, lift handle up and turn thumb key to unlock door and open. To close the doors, lift handle up and turn thumb key.